The second chapter of the apocryphal book of Ecclesiasticus begins with Sirach’s father advising him to be aware that men of faith will be tested. Sirach’s father, in the quotation I have cited from the Apocrypha, warns Sirach that making a decision to be God’s person does not prevent him from facing all the perils of human existence. In fact, failure will lead to even unexpected testing. Worse, success may test one more. Human existence is filled with joy, sorrow, victory, and calamity. All these experiences have their own tests. Fortunately for Sirach his father outlines in five ways how to meet the challenges of life. First, be self-confident and steadfast in making life decisions. Second, avoid being impetuous. Third, remain faithful. The promise of faith is prosperity or leaving a valuable legacy. Fourth, when things go right or wrong, accept that outcome, move on. And, fifth, be humble and patient with life. Somehow Jesus, now filled with God’s Holy Spirit, is whisked away to the “wilderness” where he fasts for forty days. At the end of the fast he is extremely hungry, in need of sustenance and drink; he is at his physical and mental weakest point. This is the time evil—personified in the form of Satan—comes to Jesus and offers him a way out from the path that lies before him. The task as Jesus now understands it is to be the incarnation of God, to preach peace, to seek justice, and to carry the burden of the world’s unhappiness on his shoulders. If we were faced with such an opportunity, we might consider a way out too. We must never forget that Jesus, a human with human needs, faces the test the father of Sirach has warned would come to the faithful. 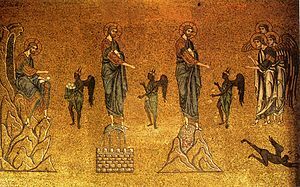 Note that when Satan tempts Jesus to fly from the pinnacle of the Temple to test whether the promise of God is valid or not, evil—once again Satan–quotes Scripture to Jesus. Satan cites the Hebrew Psalter, specifically Psalm 91. Basically, Satan is esentionally saying, “Well, there you are. If it’s in the Bible, it has to be true.” Jesus does not fall into the inerrancy trap. He only reminds evil that it is not a good idea to tempt God. Near Jericho in Palestine is an abandoned Greek Orthodox Monastery. It is on a hill called the “Mount of Temptation.” At the base of the hill is a wayside inn, actually a tourist trap. It is called the “Temptation Inn.” There are many temptations in it. Souvenirs, food, and a camel ride. Of course, money, more than a spiritual experience, is the reason for the inn. When I visited the Temptation Inn, other than finding a bite to eat, I can say that I avoided its offerings. As the tourists look up to the monastery, one can imaging Jesus could see all the nearby kingdoms from there. Today, standing on the mountain, the view is of the Kingdom of Jordan, The State of Israel, and Palestinian territory (probably Saudi Arabia can be seen from the same hill). The stark landscape of the place, the desert, and the downward flow of the Jordan River to the Dead Sea makes the environment seem dismal. There is little evidence of life. The earth and the air are dry. Only vultures fly in the cloudless sky looking for the carrion left behind by creatures unable to escape to life-sustaining water. This is the “wilderness.” This is the site Jesus entered into for fasting and preparation for the demands of his life and ministry. The view of the hill-side and the stark nature of the country moved me to contemplate Jesus’ tests or temptations. For me, in that place, it would be an easy decision to accept Satan’s offers—who would not want to be Superman and go somewhere other than this arid desert. Then I thought that Jesus, because he knew that he was God’s son and God is well pleased with him, had an inner personal and spiritual strength far beyond mine. With that strength he successfully navigated around Satan’s charm and promise of an easy way out. However, again I wondered would I be able to move around and avoid Satan under the conditions of hunger and thirst in an unforgiving environment—would anyone? Becoming the ruler of the world. Power is a wonderful thing to exercise. Daily magical thinking interferes with making rationally sound decisions about life. A young woman might think, magically I can turn my abusive boyfriend into a good husband. A person is given responsibility to care for another and because this responsibility provides a basis for power, child or elder abuse is the outcome. A man or woman is elected to responsible office but the exercise of power is more important than good government. The belief that the words of the Scripture are some kind of shaman’s incantation prevents one from sickness or death from the overuse or abuse of God’s gifts is diving off a tower expecting angels to intercept before hitting the ground. Daily, we face temptations of all sorts. That is what Sirach’s father told him—even good people face trials of success and calamity. It is the recognition that life itself is a test. This recognition refines human beings into rare and precious beings. Giving into Satan’s temptation to avoid the tests of life, leads to the ultimate human downfall. Giving up on the test of life and giving into the temptation to think magically, to seek power, to see if God is real is a distraction leading to human and personal failure. Jesus’ life teaches humanity to live above itself and to seek a higher realm than living as animals. In that higher life we find that living by animal instinct alone, which we see in those who live by power alone, defeats humanity’s created purposes. Nonetheless, in recognizing that we are frail and susceptible to Satan’s charms, provides for us a form of defense. Magic does not meet human need. Power corrupts. Testing God leads only to profound unhappiness. The recognition that humanity is frail and must find reconciliation with itself and God is the beginning of wisdom and strength. Wisdom of Sirach 2:1-6. This book is also known as the Book of Ecclesiasticus or the Book of the Wisdom of Sirach Ben Jesus.